The perfect bake-off. - add macadamia oil - healthy oil for cooking. Orgran quinoa crackers and crumbs. Herbal teas, eg ppmint, rooibos, bengal spice, sleepytime vanilla, decaff green tea, orange, dandelion. Lemon juice 1st thing, aloe vera juice - fab for digestion. Rice malt syrup is lowest GI of all natural sweeteners. and sit in jar in warm place all day, don't stir with metal. - add 1 T chia seed and fridge til thick. Vanilla - make with organic wine and vanilla pods- sit 2 mnths- eg in maple syrup bottles. Choc - make with stick blender - 1/2 c melted coconut oil, 2 Tb rice malt, 1/3 c cacao. Banana and apple sauce brill for sweetening cakes, eg oat flour cake. 4 drops essentials peppermint oil in water, evening primrose or krill oil, coconut oil. Extracts are made via alcohol extraction, and are a weaker product. and the flavors are clear/pure/authentic. Be sure that any oil you use for consumption is labeled "GRAS"
and is much cheaper - It doesn't cook, but it does warm up food. Check the flags at the top to buy from other countries. so a dream to cook/braise meat or fruit, veg without fat or water. A stick mixer is a good purchase You can simply place it in a pot of soup and bloend it. It is best to visit a store and research the power and functions eg 800 watts is good. Youtube.comThe Best Cookware You've Never Heard Of! to get a healthy, homemade meal on the table 95% of the time. I plan early in the day what I will make, so there is no panic later. ie consider we are so special to God, we can't use your stomach as a trash can. It is a blessing to feed our families with the food God made. There is also an effect based on the quality of the cookie sheet used. soft, flat, thick, cakey, greasy, bland, flavorful, moist, or crumbly? 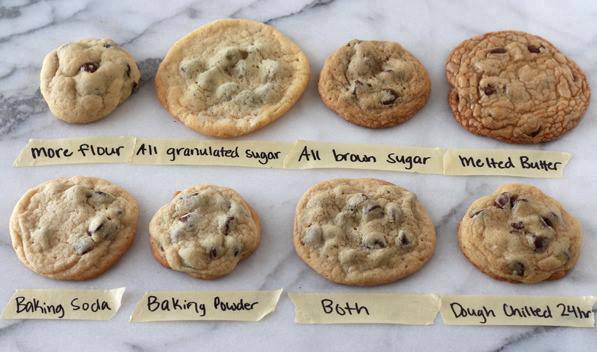 This shows how various ingredients and techniques affect taste, texture, appearance of cookies. Create your own recipe that produces cookies just the way YOU like them. Removed baking soda from recipe and used 1/2 teaspoon baking powder. This produced results that were more cakey and puffed while baking. Used 1/4 teaspoon baking powder and 1/4 teaspoon baking soda. This produced crisp at the edges, soft in the middle, with a good amount of spread. The combination of the two leaveners produced the best results in my opinion. Increased the flour to 2 cups (250 grams) which created a more crumbly dough and very little spread. The cookies were small yet thick and relatively undercooked (ooey and gooey) in the middle. I replaced the room temperature butter with melted and cooled butter. until the sugar was better absorbed by the butter. This produced flatter cookies that had a shiny, crackled top reminiscent of brownies. They were also more crisp at the edges. these cookies fell very flat as you can see by the way the chocolate chips protrude. I used 3/4 cup packed light brown sugar in this recipe which produced thick, brown, and soft cookies with an intense butterscotch flavor. The original control recipe uses an even ratio of granulated and brown sugars. If you prefer cookies to be flatter, chewier, or crisper, use more granulated sugar. If you prefer cookies to be softer and thicker and have a pronounced butterscotch flavor, use more brown sugar. I used the control recipe but chilled it in the fridge for about 24 hours before shaping and baking. This produced cookies that were slightly thicker, chewier, darker, and with a better depth of butterscotch flavor. If you have time, try chilling your next cookie dough for at least 24 hours, or up to 48 hours. or salba seed + 3 tablespoons hot water. A beautiful moist texture/sweetness for egg free cakes, breads and muffins, and is inexpensive. 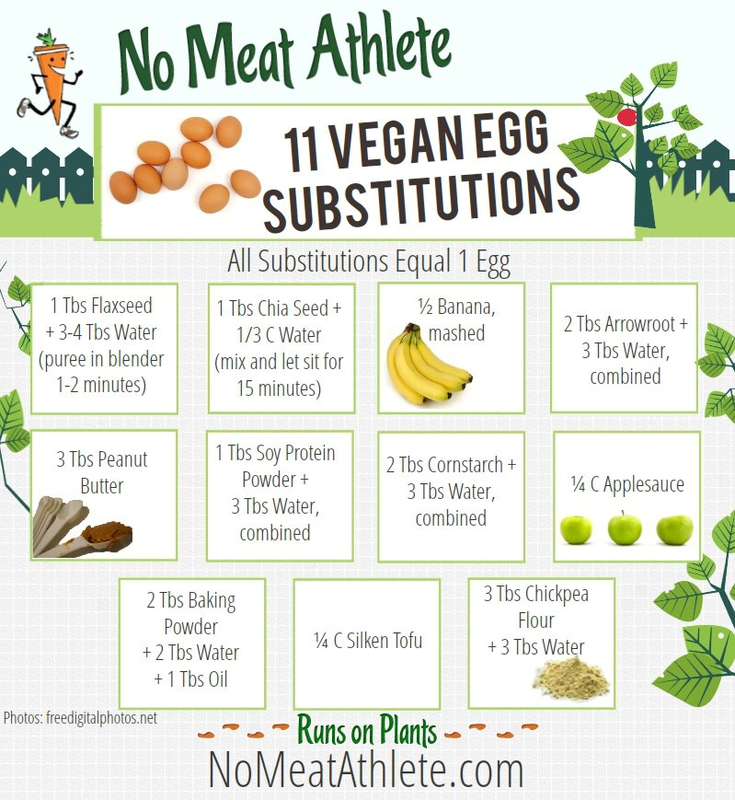 1 Egg White = 1/4 teaspoon of Xanthan Gum with 1/4 cup Water. Let stand. When thickened this mix can be whipped and used as an egg white. 1 Egg = 1 teaspoon gelatin dissolved in 3 tablespoons of boiling water. Gel slightly in freezer for approximately 5 minutes. Beat like a regular egg and add to recipe. This adds a texture similar to real eggs. wheat, dairy, sugar, bad oils, bad salt. To be safe- eat food as God made it. Inspiration-, check out these photos Arstechnica.com/view delicious food. use honey, maple, stevia in this GF, DF, additive free creole seasoning. Water-chestnut, Millet, Sorghum, Sweet Brown Rice, Teff, Cassava, Lupin, Besan. NOTE-buckwheat, amaranth and quinoa, are not sweet, so are better for savoury baking. or make it by blending steamed or stewed apples in blender or food processor. Grain-free baking powder, you can use 1 part cream of tartar + 1 part baking soda + 2 parts arrowroot. Baking with almond flour causes oxidation of polyunsaturated fats in the almonds. ie the fat in the nuts become rancid when heated, which is not great for health. 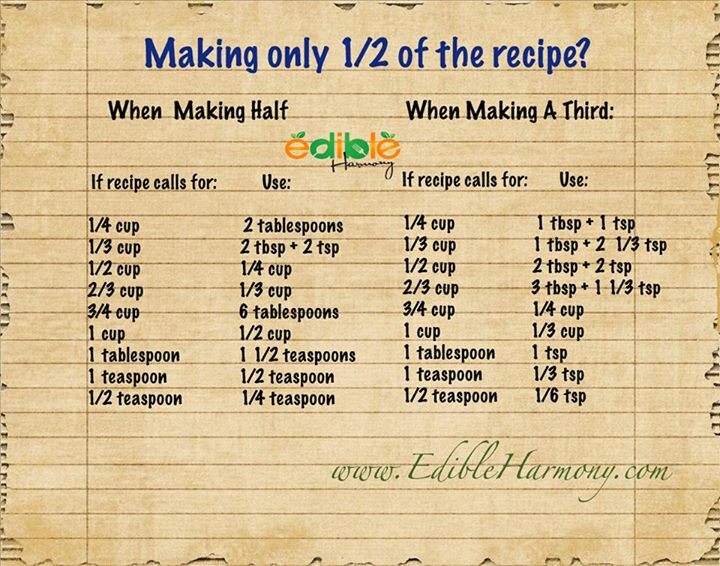 it takes A LOT of almonds to make 2 to 3 cups of flour! and this isn’t the best for health or waistlines. Everything in moderation, so the majority of the time, coconut flour or water-chestnut flour are healthier. It may seem expensive, but you don't need much coconut flour – usually half a cup, so a bag will last a long time. and buy a good stock of healthy food, to make yummy things like ccnut milk-fruit mousse/icecreams. 3. Dedicate time to prep your meals. 6. Eat homemade broth regularly to boost your immune system and give you strength. Use it as a base for soups and stews, or drink straight from a mug. 7. Remember: this is worth the initial adjustment period. It really is. The reason we long-timers appear over-enthusiastic at times, is because we feel soooo much better. 8. Stick to your guns and you WILL be successful. 12. Remember why you are doing this, check in with yourself and be proud of the choices you have made. 15. Read labels, but try to avoid dead/processed/packet products. 17. It may seem overwhelming at first, but it is sooo worth it.- there is a lot of help nowadays. 19. Pick a new recipe or two, once a week. Avoids boredom and keeps life interesting. 21.Do not just try to substitute food you once ate. Don't mourn the loss of food that makes you sick . Look forward to new horizons, a new you, we all get there..
22. One of the hardest things about eating Paleo is the social pressure to eat junk. SO- Always have a plan before going to social gatherings! (I would add that your Paleo dish will be so tasty that it will be the first to go! 25. Eat organ meats, from organic, pastured animals - cheap and chock full of nutrients. 26. Follow chowstalker.com and Just Eat Real Food to get recipe ideas. 27. Read and follow Paleo blogs and books. The more paleo inspiration, the easier it is. 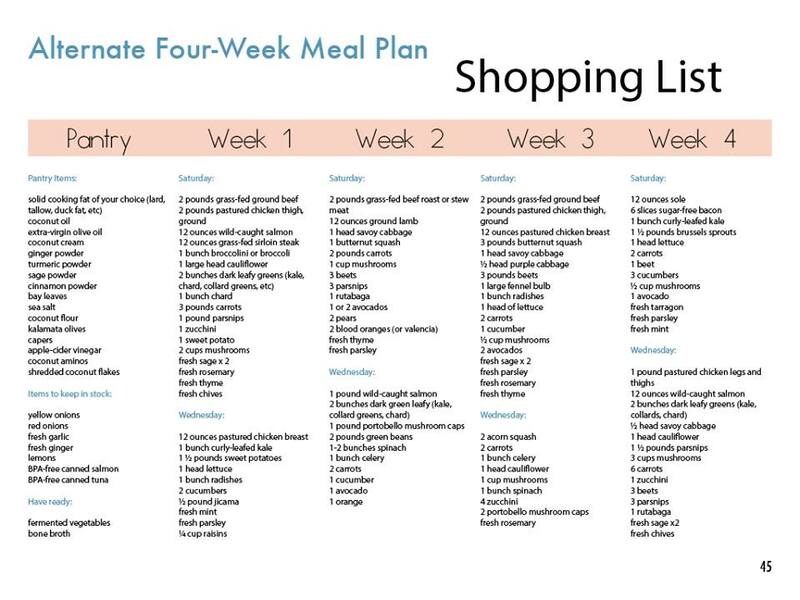 It also includes two 4-week meal plans, shopping lists, tips and tricks, and other resources for those on the autoimmune protocol or an elimination diet. The book is also helpful for those with multiple food allergies or sensitivities. It is full of inspirational photos and fully interactive. IBS, chronic fatigue syndrome, and fibromyalgia all improved almost immediately. and I had a dull ache in my lower back.